There are worse things to write about in English than Finnish horror fiction! Though translating your Finnish writing about various materials, even in summary or as a gloss, isn't the worst thing you could do for a blog entry. 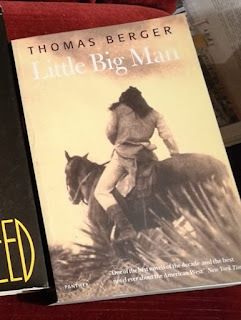 I've been meaning to read LITTLE BIG MAN for some decades...a copy is buried in one or another of my storage boxes (happily, not in one of the recently soaked ones I've had to open and go through), but haven't read it yet. Berger's reputation is Mostly good in the US, with some dissenters. Oddly enough, I haven't even seen the film in its entirety so far...been avoiding it since picking up the copy of the novel! Hm...the anti-western...it's less a defined territory than it might once have been. William Burroughs fits in where? Whither cowpunk? Book packaging usually Not what it should be. Sorry, Todd, for some reason I didn't notice your comments until now. There just isn't time to do extra writing, save for every now and then, and even then it requires extra effort. Been blaming Facebook for this. William S. Burroughs surely is an anti-Western writer, though haven't read his Western Lands trilogy.